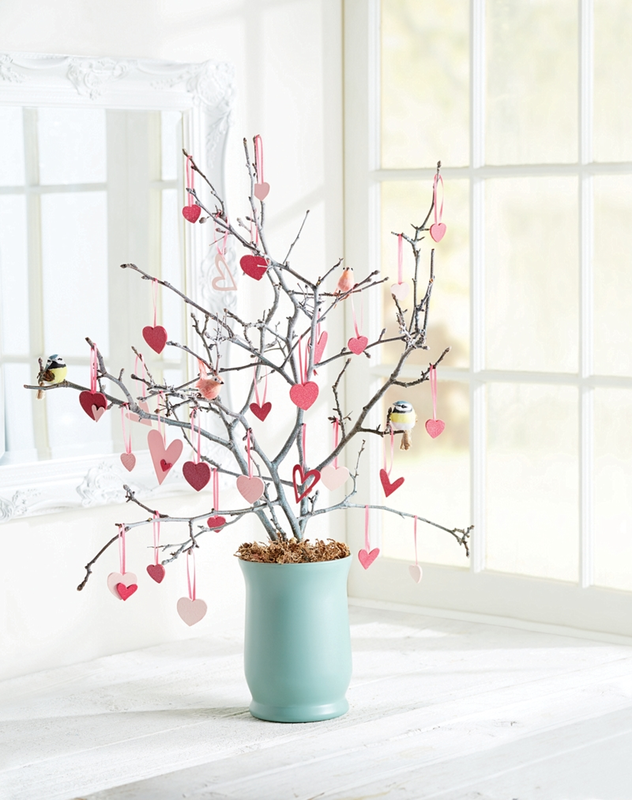 Add a bit of "LOVE" to your decor for Valentine's Day with this darling tree! Florist Dry-Foam to fit inside of vase. Tree of Hearts was designed by Roxi Phillips. Gather twigs and/or small tree branches; group and trim to an arrangement. Spray twig arrangement with Krylon® Glitter Blast™ Diamond Dust. Thoroughly clean vase to remove any oily residue. Spray paint vase with Krylon® Primer White; allow to dry. Spray paint primed vase with Krylon® ColorMaster™ Catalina Mist; allow to dry. Spray paint all hearts, on both sides, with Krylon® Primer White; allow to dry. Spray both sides of half of the hearts with Krylon® ColorMaster™ Mambo Pink, and the other half with Krylon® ColorMaster™ Ballet Slipper; allow to dry. Spray hearts with Krylon® Glitter Blast™ Diamond Dust. Insert florist dry-foam block into inside bottom of vase. Insert twig arrangement into foam. Cover foam with Sphagnum moss. Cut ribbon into 6" lengths. Form length of ribbon into a loop; hot glue both ends of ribbon to backside of heart. Repeat for remaining hearts. Embellish Valentine Tree by hanging hearts and attaching birds onto branches.